Right next to it, near the upper right-hand corner, there are two buttons: Select and Create. These buttons allow you to change the TM being displayed. In fact, you can display any TM by selecting a database from the dialog box shown and clicking on the Select button. By clicking on the Create button, you can create and display new databases. · The left side of the dialog box contains all you need for sorting, filtering, and navigating through the TM being displayed. You can sort the TUs in several ways. To change the sorting rule, select another item from the Sorting drop-down list. Moreover, you can choose between ascending and descending order in the drop-down box located next to it. The main filter is a tool for database experts who are familiar with Microsoft Access (though the technique is easy to learn). To filter the database, select a field in the first line. Select a function and enter the value whereby you want to filter the datasets. You can combine several filters in the five lines available. To apply the filter settings, click the Apply and close button. When you have activated the main filter, the Main filter: not active button will change to Main filter: active. To clear the main filter and display all datasets of the TM, click the Clear button. The mini filter is very easy to use. You simply have to add a text in one or both text boxes below the Clear mini filter button. When you enter a text in the left text box (while the right text box is empty) and press the tabulator key or the Return key on the keyboard, only those TUs which contain the text entered in the source segment are shown. When you enter a text in the right text box (while the left text box is empty) and press the tabulator key or the Return key on the keyboard, only those TUs in the translation which contain the text entered are shown. When you enter text both in the left and the right text box, the result depends on the setting Operator for mini filter. If the operator is set to "AND", then only those TUs will be displayed where the source text contains the text in the left box AND the translation contains the translation in the right box. If the operator is set to "OR", then only those TUs will be displayed where the source text contains the text in the left box OR the translation contains the translation in the right box. To clear the mini filter, click the Clear mini filter button. 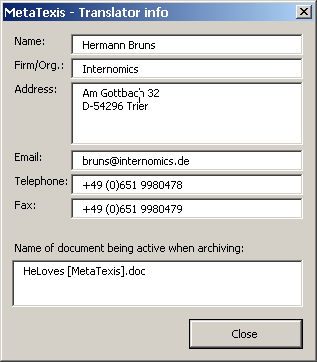 The main element of the left side of the dialog box is the list box containing the TUs. Each line represents a TU. The left column lists the source segments; the right column lists the translations. To navigate in the TM, click one item in the list box and go up or down in the list using the Up, Down, Page Up, Page Down, Home, and End keys. Alternatively, you can use the navigating buttons located on the left side below the list box. The gray box on the right side of the navigation buttons, below the list box, tells you which dataset is currently selected. · On the right side of the dialog box, the TU selected, including all its details, is displayed. The source language and the source text are shown on the left side; the translation language and the translation are shown on the right side. The categories are shown below. 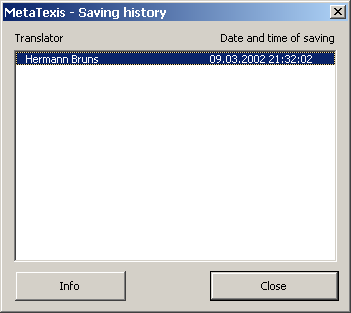 The Saving history dialog box displays the saving history of the current TU, that is, the history of new translations saved in the TM. This is, in fact, a part of the saving history. ▪ Date of last usage: Date of last time when the TU was retrieved from the TM and presented to a translator. ▪ Import/Export: see the Importing and Exporting TMs and TDBs. ▪ Delete: When you click the Delete button, the selected TU will be deleted (after you have confirmed deleting). ▪ Take over: When you click the Take over button, the translation of the selected dataset is taken over into the document (but only if the cursor is placed in the translation box of an open TU). ▪ Close: To close the Database center dialog box, click the Close button.